To celebrate the 30th anniversary of the Nobel prize in scanning tunnelling microscopy (STM) and the 30th anniversary since the first paper in atomic force microscopy (AFM), Nanotechnology™ has been organising a focus collection with guest editors Franz Giessibl, Rodolfo Miranda and Johannes Barthes to collate some of the latest cutting-edge progress developing and exploiting these scanning probe techniques. 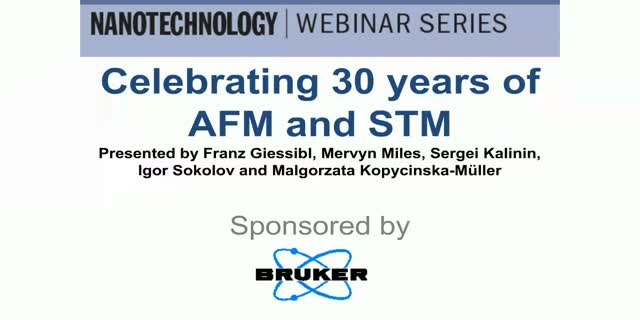 In this webinar, we invite one of the guest editors of the collection, members of our editorial board and authors of contributions in the collection itself to join our panel to look at some of the highlights in STM and AFM over the past 30 years and some of the most exciting research developments in the field today. FDA-cleared in 2017, the ZAP-X gyroscopic radiosurgery platform is the latest innovation from John Adler, inventor of the CyberKnife and professor of neurosurgery and radiation oncology at Stanford University. Integrating a modern linear accelerator with gyroscopic mobility to deliver diverse non-coplanar beams, ZAP-X is a dedicated intracranial SRS system focused on ease-of-use, uncompromised patient safety and a world-class dose gradient. ZAP-X is built upon a first-in-kind self-shielded design that typically eliminates the need for radiation vaults. This new capability enables simple and cost-effective departmental expansions while also making SRS delivery available in locations that were previously not feasible (for example, physicians offices, outpatient centers and satellite facilities). Combined, ZAP-X strives to remove historical costs and complexity constraints to put SRS within reach of more providers and more patients. In this webinar the physics and clinical implementation of Monte Carlo dose check and plan QA will be discussed. Dr Marcus Alber, a leading Monte Carlo expert, will present the importance and value of QA accuracy based on Monte Carlo, as well as the specific benefits of the SciMoCa application. Dr Christoph Fuehrweger, a medical physicist at the Munich CyberKnife Center, will present the clincial implementation and benefits of the Monte Carlo stereotactic plan QA. During the webinar, Dr Arjun Sahgal will share his perspective on the latest trends for treating brain metastases. Dr Sahgal will examine the most recent published clinical data comparing the benefits of SRS with previous treatment techniques, and the use of the most recent technologies available. The session will explore traditional treatments with WBRT and compare some of the latest SRS techniques used to treat specific targets and their clinical outcomes. Discussion is focused on precision radiation medicine, improving outcomes and quality of life for patients. Join Dr Trevor Lane as he hosts a webinar covering an introduction to writing research articles. In this webinar, you will learn how to write original research articles clearly and concisely and use an appropriate writing style for journals. You will also gain valuable insight into making strategic publication decisions that will help increase your chances of publication success. A new class of radiation devices is emerging, and it has the potential to transform how cancer is treated through more precise tumor targeting and adapting treatment at the time of delivery. High-field MR-linac technology integrates the power of state-of-the-art MR imaging with precision radiation technology. It can deliver precisely-targeted radiation doses while simultaneously capturing the highest-quality MR images. This will allow clinicians to visualize tumors and the surrounding healthy tissue at any time during radiation delivery, and then adapt the treatment accordingly. High-field MR-linac devices based on diagnostic-standard MRI technology will offer many avenues for exploring improvements in radiotherapy, such as shorter treatment regimens or targeted adaption of the treatment in real time. Also, by integrating precision radiation and MRI technologies, high-field MRI capabilities can be optimally explored to help bring personalized cancer care to radiation therapy. During this webinar, clinical experts will share their experience with Elekta Unity. The webinar, aimed at early career researchers, will cover a range of topics including how to choose the right journal, peer-review and publication ethics, and your open access publishing options thanks to funding agreements in Austria. As the imaging and analytical capabilities of the modern transmission electron microscope (TEM) have improved, it has become an increasingly vital tool to characterize and study nanoscale materials. With the advent of MEMS-based sample supports, researchers are now capable of easily heating and electrically characterizing their sample in situ, directly imaging the dynamic sample reactions occurring at the atomic scale. For semiconductor and electrical device applications, Protochips has developed focused ion beam (FIB) tools and sample preparation workflows that enable researchers to prepare FIB lamellae directly on MEMS-based sample supports, allowing pA-level electrical characterization of their sample at atomic resolution. With the growing interest surrounding graphene and other 2D materials, in situ TEM has become increasingly utilized to accelerate the discovery of these next-generation materials. At Oak Ridge National Laboratory, researchers Xiahan Sang and Ray Unocic used in situ heating to synthesize and characterize complex structural and chemical transformations of edge defects at atomic resolution. Their work pioneered new means by which 2D materials could be engineered directly in the TEM, opening new avenues for materials development and characterization. These and other novel results in the field of material science will be presented in this webinar. During the first part of the webinar, Fredrik Löfman, head of machine learning at RaySearch, will discuss how RaySearch is pioneering machine learning for smarter and faster oncology software. He will talk about the upcoming machine-learning applications in RayStation that will be released in December*: automatic treatment planning and automatic organ segmentation. Furthermore, Löfman will discuss some of the other machine-learning projects that RaySearch is working on, such as target-volume delineation, analytics on oncology data and RayCare as a learning system. In the second part, Tom Purdie, medical physicist at Princess Margaret Cancer Centre, will talk about automatic treatment planning and machine learning from a clinical perspective. He will present results from a clinical comparison between retrospective plans and ML automated plans. English is the lingua franca for scholarly communication, and most international journals with a wide global readership are printed in English. Submitting manuscripts in poor English can put researchers at a disadvantage and delay the publication of research. This session will highlight the importance of quality English writing and the need to communicate your research effectively. This session will also focus on understanding journals and the types of manuscripts they publish, so that you can identify the best type of article for your study. During the past decade, increased attention has been shown to hard X-rays in the photoelectron spectroscopy (HAXPES) field. This is mainly due to the increased information depth enabled by the higher photon energies. Such bulk sensitive measurements could previously only be performed at dedicated synchrotron radiation facilities. The beam lines providing this type of radiation are heavily booked, so access to the experimental setups is thus limited. Higher excitation energies also enables bulk sensitive measurements of deep core levels not accessible with standard XPS. We will present a new system featuring a monochromized X-ray source giving out Ga Ka radiation at 9.25keV and a wide acceptance angle hemispherical electron analyzer, both combined on a simple to use vacuum system. With this system, a new set of possible experiments opens up in the home laboratory: investigations of buried interfaces, in operando devices, real world samples, etc. Join us for this 45 minute webinar with the author of Sun Protection: A risk management approach, Professor Brian Diffey. Professor Diffey will give an overview of his book, key learning points and answer your questions in a live Q&A. Sun Protection differentiates itself from other texts by adopting a risk-management approach to determine whether, how, and in what circumstances, harm might be caused, and to explore the feasibility of various strategies in controlling exposure to solar UV radiation. This multi-disciplinary book covers topics from climatology through human exposure to sunlight, as well as biological and clinical effects of UV radiation to physical and chemical strategies for photoprotection. This webinar is recommended viewing for biologists and dermatologists and will be of interest to physical scientists and those working in the skin care industry. Air was first liquefied in 1877. Since then, the cooling power has been harnessed for many applications that have impacted science and society. In this webinar a review of the applications that cryogenics has enabled will be presented. From gas liquefaction to the use of cryocoolers in applications such as MRI scans, particle detectors, accelerators or fusion technology. Looking to the future of cryogenics, quantum-computing promises vastly increased computational power via the use of novel materials. Superconducting and cryogenic technologies offer cleaner, more efficient transport and power networks. Learn about the rationale and workflow for modifying radiation therapy treatments while the patient is on the table using Real-time On-table Adaptive Radiotherapy. Clinicians from hospitals in Amsterdam and St. Louis, MO will discuss their methodologies and clinical outcomes with the MRIdian® Linac system. MRI-Guided ROAR™ - Real-time On-table Adaptive Radiotherapy represents a new paradigm in the treatment of cancer, providing clinicians with the ability to improve targeting precision and thus deliver higher, and potentially more effective, radiation doses. Delivering the latest news, views and information for the global physics community.